Charles O. Morgan, Jr., Esq. Planning is already underway for the 2018 Informed Families Dinner at Joe's. Who can resist sharing a dinner of Joe's Stone Crabs with family and friends? The annual Informed Families Dinner at Joe’s is an event with NO boring speeches; just good friends and families who want to help kids grow up safe, healthy and drug free! 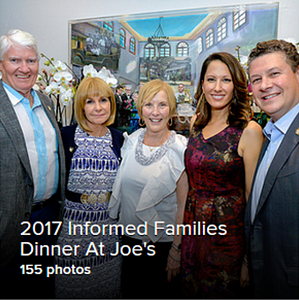 The Informed Families dinner at Joe’s brings out Miami’s best families. Will you be part of next year's festivities? For more information, please contact Milly Davila at Edavila@Informedfamilies.org or 305-856-4886.